There have been various designs of no bit bridle (hackamore, bosal, and sidepull) in use for many years, but the crossover / cross-under / crosspull / whole-head-hug design (a defining feature of The Bitless Bridle™) is the only one to provide both pain-free and comprehensive communication. 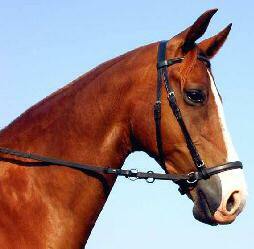 Dr W R Cook, a UK-trained equine vet, first marketed The Bitless Bridle™ in the USA in 1999. It is the only bitless design that has been developed and physiologically validated by a respected veterinary surgeon, one who has focussed 50 years of his research on the mouth, ear, nose and throat of the horse, particularly unsoundness of wind, the cause of bleeding in racehorses and the harmful effects of the bit method of communication. For the time being, all the articles, feedback and information about the Dr Cook crossover bitless bridle will remain on this website as an important resource for anyone searching for information on bitless bridles. The Bitless Bridle™ is versatile - three items of tack in one! Apart from its primary and obvious use as a bridle, The Bitless Bridle™ also easily converts to a halter (like the Be-Nice Halter) for leading, loading, lungeing or training as well as a headcollar. Detailed instructions are supplied in the comprehensive User's Manual supplied with every Bitless Bridle™. A guide to sizes, materials, and how to measure your horse is here and is also available to download as a pdf file, so you can print it out to have with you when you measure your horse: download Sizes and Measuring Guide for The Bitless Bridle™. What sort of bridle do you currently use? One with a bit - snaffle, snaffle plus drop or flash noseband, curb bit, gag? Or do you currently use a bridle with no bit - mechanical hackamore, Western hackamore, jumping or English hackamore, bosal, sidepull? Do you know how it works and what the distribution of pressure is? For a quick comparison of the main methods of communication (bridle) have a look at this table. 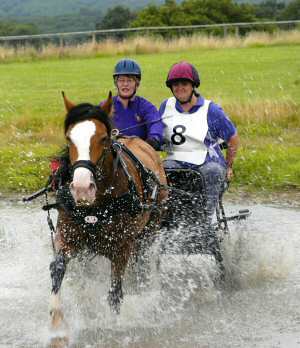 For full information, articles and feedback (good and bad) from users of The Bitless Bridle™ please refer to the main web site www.bitlessbridle.com. See also UK User's Comments' page on this site.